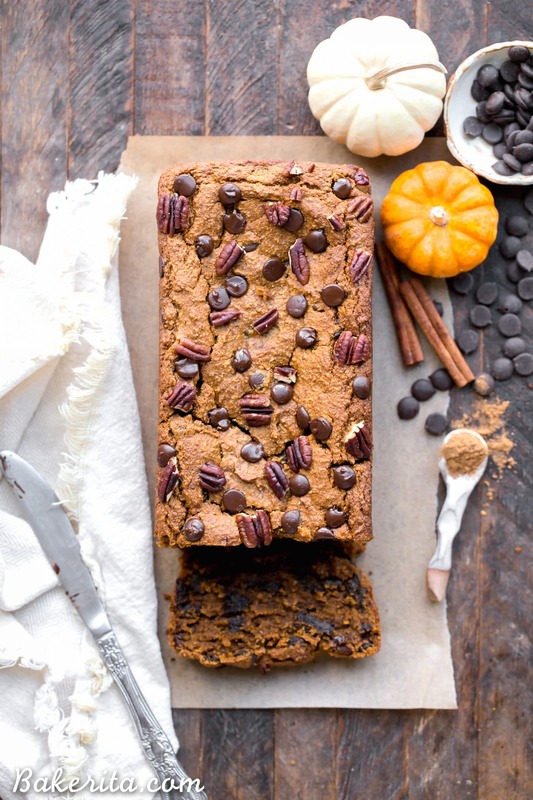 This Chocolate Chip Vegan Pumpkin Bread is quick and easy to make in one bowl! It’s warm and flavorful with lots of pumpkin pie spice and full of gooey chocolate chips. 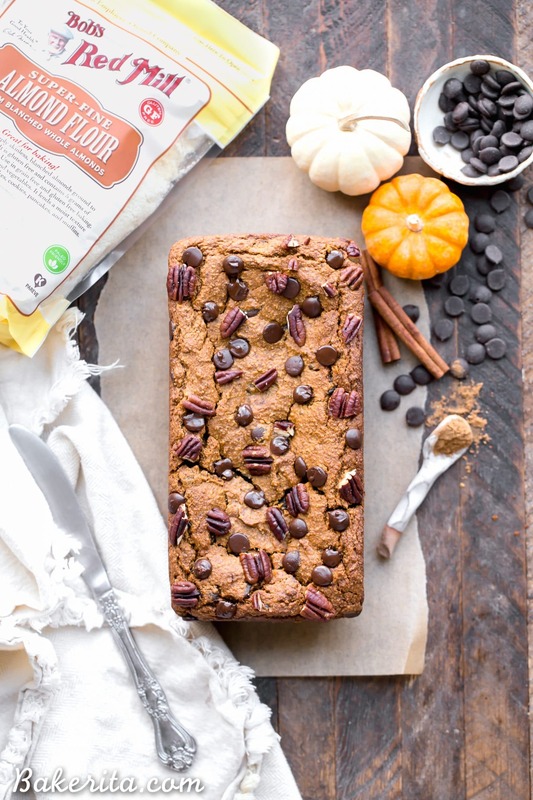 This gluten-free, refined sugar-free, and vegan pumpkin bread makes a perfect breakfast or snack! Thank you to Bob’s Red Mill for sponsoring this post. 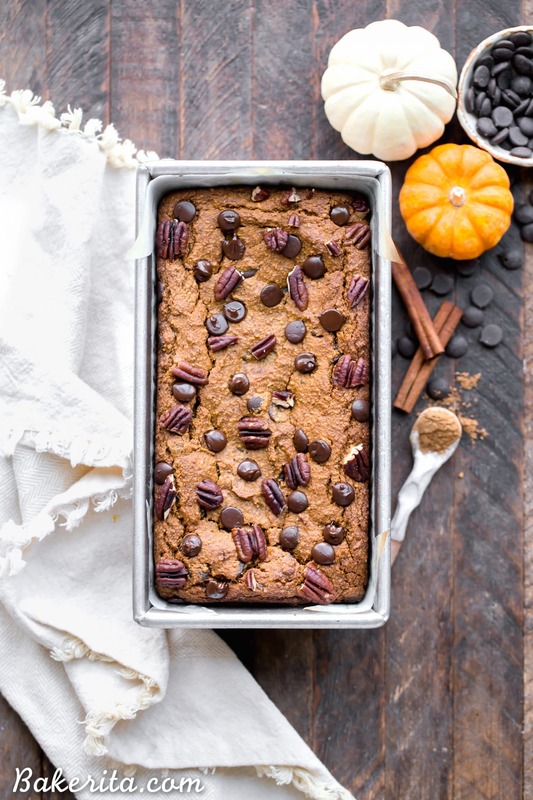 I posted my paleo pumpkin bread recipe over 3 years ago, on my 22nd birthday, and don’t get me wrong – that chocolate chunk pumpkin bread is so delicious. It’s moist and sweet and full of spiced pumpkin flavor. But these days, I’ve been following a more plant-based diet, and though I’m not fully vegan, I’m pretty close…so most of the time, there are no eggs in my house. Which means, naturally, that I needed to create a vegan pumpkin bread recipe. For me, for all those times I don’t have eggs, and for you guys, whether you’re vegan, or you also just don’t have eggs in your house. 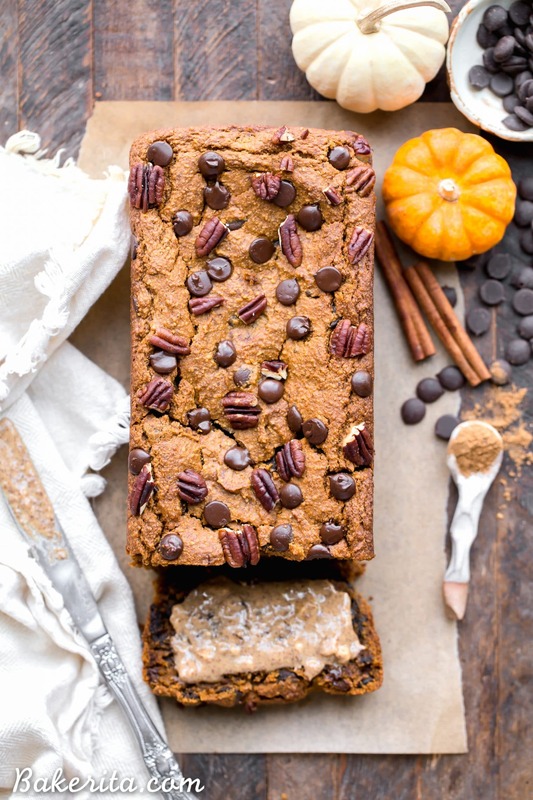 Either way, I think you’re going to be allll about this pumpkin bread. You certainly don’t have to be gluten-free OR vegan to be stoked on how good it is. It’s simple to bring together in just one bowl, and it only takes about 10 minutes. It has a good amount of pumpkin puree, which helps keep things super tender and moist, but not so much that the pumpkin bread is too “wet” – which I’ve historically found to be an issue with pumpkin bread. It’s sweetened with coconut sugar and some nut butter in there helps keep things super rich, while adding structure too. I used almond butter, but any kind of nut butter will do! Just be aware that if you add a more strongly flavored nut butter, like peanut butter, that flavor will come through a bit. For the flours, I used almond flour and oat flour, both from Bob’s Red Mill! They’re my go-to flour brand, which you probably know if you’ve spent some time with my recipes. Make sure you source the gluten-free oat flour if you’re strictly gluten-free because while oats are naturally gluten-free, they’re frequently subject to cross-contamination. Thankfully, Bob’s has a special GF oat flour that is processed in a GF facility. The oat flour here helps provide a lot of structure and makes sure the bread doesn’t get too wet. I haven’t experimented with any other kinds of flour in place of the oat, so I can’t make any guarantees if you’re trying to keep this paleo too! You can’t have pumpkin bread without a hearty dose of pumpkin pie spice, so 2 teaspoons are added to the bread. If you don’t have pumpkin pie spice, I give alternate measures of the spices that go into pumpkin pie spice for you to use! Finally, you’ve got to have chocolate chips! Well, you don’t have to, but I’d recommend it. If you want to skip them, you can use nuts instead or just keep it pure. You can also skip some of the chocolate chips and add nuts in their place, for a chocolatey nutty combo. mmmm – so good. Hope you guys love this recipe as much as I do! 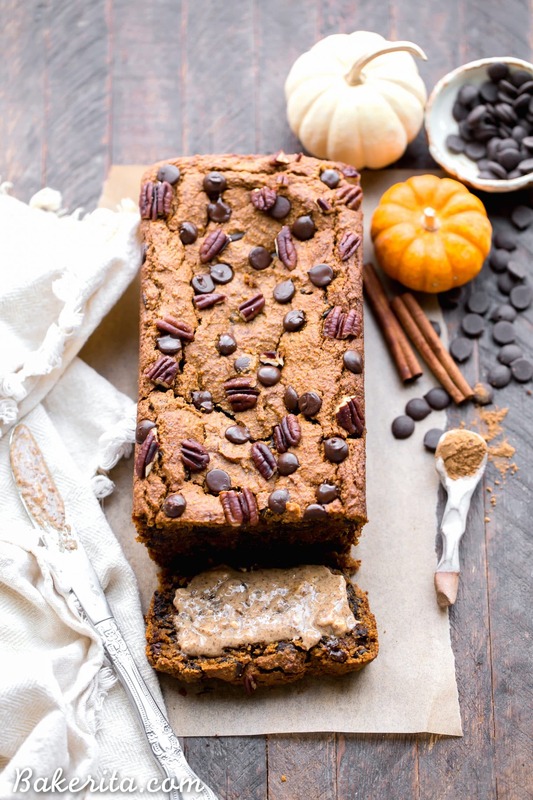 This Chocolate Chip Vegan Pumpkin Bread is quick and easy to make in one bowl! It's warm and flavorful with lots of pumpkin pie spice and full of gooey chocolate chips. This gluten-free, refined sugar-free, and vegan pumpkin bread makes a perfect breakfast or snack! Preheat oven to 350°F. Grease an 8.5” x 4.5" loaf pan (you can also use a 9x5” pan) with coconut oil and/or line with parchment paper. Combine pumpkin puree, almond milk, coconut sugar, nut butter, coconut oil, vanilla extract, and flax meal, stirring to combine. Add oat flour, almond flour, baking soda, baking powder, salt, and pumpkin pie spice. Stir until combined. Fold in chocolate chunks. Pour into loaf pan and even out the top. Add chocolate chips on top and if desired, some chopped pecans. Bake for about an hour, or until a knife or toothpick inserted into the center comes out clean. If your loaf looks like it's getting too brown, tent with tin foil on top after 45 minutes. If you’re using a 9x5” pan, check on the banana bread after 40-45 minutes. To keep this bread refined sugar-free, I use Coconut Sugar Sweetened Chocolate Chip from Santa Barbara Chocolate. You can use the code BAKERITA for $10 off if you decide to order. What chocolate chips do you use to keep in with no refine sugar? Oops I’ll add a note about that to the recipe – I use the coconut sugar sweetened chocolate chips from Santa Barbara Chocolate. The code BAKERITA will get you $10 off! Is the pumpkin purée from a can? Can I make my own out of squash? Is there something I can sub for oat flour or is it pretty crucial to the texture? Hi Megan, it definitely makes the best texture but you could probably sub more almond flour. Does it have to be gluten free oat flour? or can it be regular? Regular oat flour is fine! I just say GF to keep the recipe gluten free. Enjoy!